After many studies, debates, and disappointments, Bloor Street has a permanent bike lane. The historic decision follows a 36 to 6 vote by City Council on November 7, 2017, to make the pilot bike lane, which stretches 2.4 km from Avenue Road to Shaw Street, permanent. The victory must be measured in more than kilometres. The approved bike lane on Bloor unlocks the potential for transformational change for cyclists in Toronto, and for the city itself. The pilot bike lane was installed in August 2016, and was then poked and prodded like virtually no other road project before it in Toronto. Over the last year the impacts on local businesses, motor traffic, pedestrians, and cyclists were all studied. When the pilot passed all these tests with positive numbers, the matter returned to the Public Works and Infrastructure Committee (PWIC) on October 18, 2017. With an encouraging 4 to 2 vote, PWIC recommended approval of the permanent bike lane and sent the matter to the full council for a final decision. Bloor has long been important for cyclists (and residents who would cycle but for the danger) for both practical and symbolic reasons. Cyclists use the east-west Bloor thoroughfare for the same reasons as other road users: it’s convenient and useful for getting downtown and to popular local destinations like the University of Toronto, cultural venues like the Royal Ontario Museum, and shopping areas in the Annex and Koreatown. The high cycling volumes on Bloor are no recent phenomenon. Beginning with the bicycle revival of the 1970s, Bloor quickly became one of the city’s top cycling routes. In fact, many decades earlier during the ‘bicycle craze’ of the 1890s, Bloor was proposed as part of a Toronto bicycle path network. 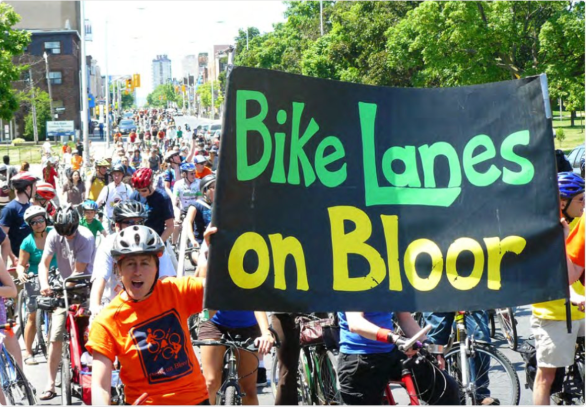 In addition to being a convenient bike route, “bike lanes on Bloor” has become a rallying cry for the cycling community in Toronto. If a popular cycling route like Bloor can’t have a bike lane, the city couldn’t credibly say that cycling or cyclists’ safety matters. As long as the city mostly put bike lanes in places that are convenient to motorists or acceptable to local merchants --- instead of where they are needed by people who want to bike --- a proper cycling network would not be possible. Bike lanes on Bloor have been studied many times since the beginning of the 1970s. The first study, by city consultant Barton Aschman in 1977-8, ranked Bloor at the top in terms of cyclist numbers, cycling growth potential, and cyclist injuries. In 1992, City consultant Marshall Macklin Monaghan (MMM) - as part of a City policy to address climate change - identified Bloor-Danforth as a potential spine of a city-wide cycling network. MMM recommended full implementation by 1993. In 2007, a feasibility study for Bloor-Danforth bike lanes was undertaken. The report was never released although it morphed into a decision to study the environmental impacts of such a bike lane – a bizarre development, the absurdity of which only made sense in the context of the city’s historic fear of cycling infrastructure. Another preliminary study followed. 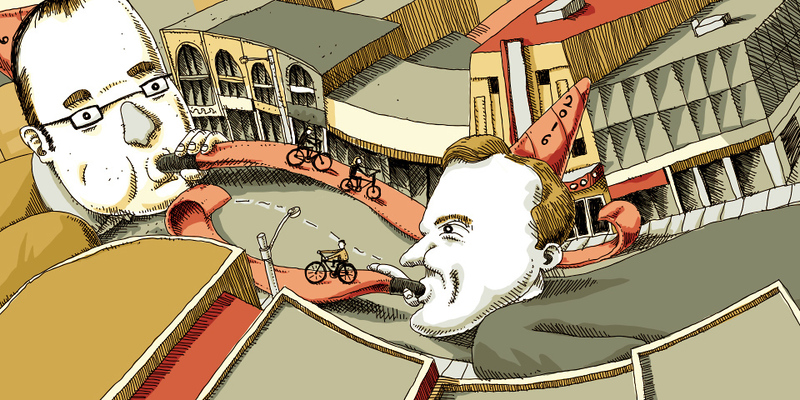 Subsequently, the pilot, championed by local residents’ groups, Councillors Joe Cressy and Mike Layton, and the cycling community, was approved by city council in May 2016. The 2.4 kilometre Bloor bike lane is not the end game for cyclists. It is, however, a key first step in getting a 20-km bike lane across Bloor-Danforth, as proposed in the 1992 MMM report, and connecting it to new north-south routes. The pilot shows that bike lanes on Bloor work. Indeed, the current, short bike lane on Bloor works even though it is a mere stub that ends at Shaw St. on one end and Avenue Rd. on the other. This victory is also to be measured by lower greenhouse gas emissions, commuter costs, traffic congestion, and air pollution, along with better levels of physical fitness and health. The vote opens the door for cycling to become safe across the city, and for what Andre Vallillee of the Metcalf Foundation calls "transformational change" to make Toronto a more vibrant, sustainable, and healthy city. The City’s staff report of October 3, 2017 about the pilot confirms, albeit in a bureaucratically conservative tone, the advisability of expanding the bike lane east and west. The pilot project has demonstrated that a cycling facility can be successfully implemented on one of the busiest and most constrained sections of Bloor Street and should be considered for the full length of the Bloor Danforth corridor. Further study, consultation, design and council approval would be required for other sections of Bloor and the Danforth. City staff have confirmed that a connection from Church to Sherbourne is already part of the 2019 City capital works schedule. Other east and west extensions will be studied, albeit with somewhat nebulous timelines. We know that the city will need an additional push. Without such pressure, the city will likely fall back into comfortable patterns where studies are substituted for action and where the priority remains accommodating single-occupant cars. We have much work to do. This vote is a historic moment for Toronto and a major achievement for cyclists. The door is now open to real change in Toronto; where cycling is treated as a legitimate mode of transport, where safety on the public road is a priority, and where vibrant, liveable neighbourhoods are the goal. Photo of Angela Bischoff and thousands of cyclists on Bloor by Martin Reis. Albert Koehl is an environmental lawyer and founding member of Bells on Bloor.